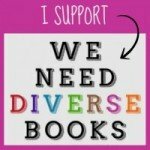 – is reviewed today by Cathy Ballou Mealey. 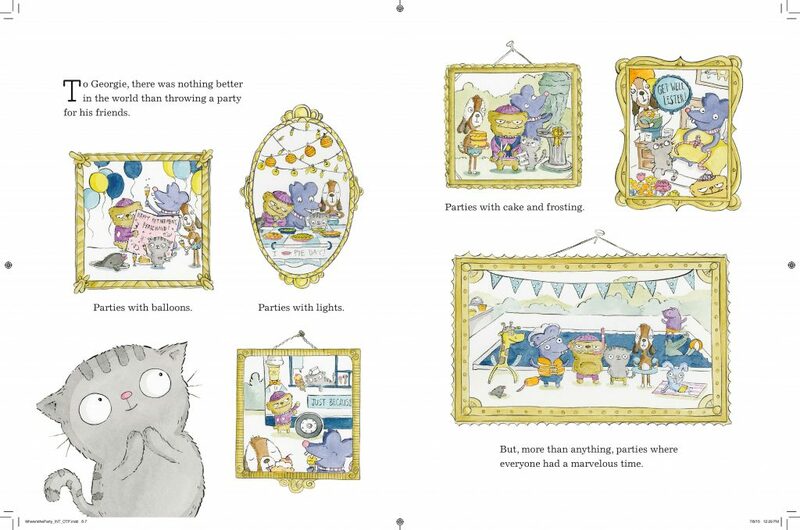 Filled with silly charm and endearing characters, Ruth Chan’s debut picture book WHERE’S THE PARTY? is a cheerful delight for fans of parties, plans, cats and cake. Georgie, our furry feline hero, is the hostess with the mostest when it comes to special celebrations. He’s gathered friends for pool parties, topiary competitions, Pie Day, and ice cream truck fests. So it is no surprise when he wakes up with a smile on his face, ready to plan a spectacular party, choose the biggest cake in the bakery, and invite all his friends. Interior spread from Where’s the Party? 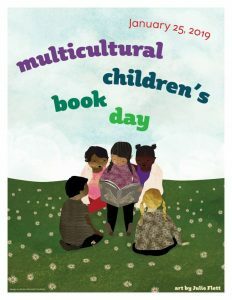 written and illustrated by Ruth Chan, Roaring Brook Press ©2016. 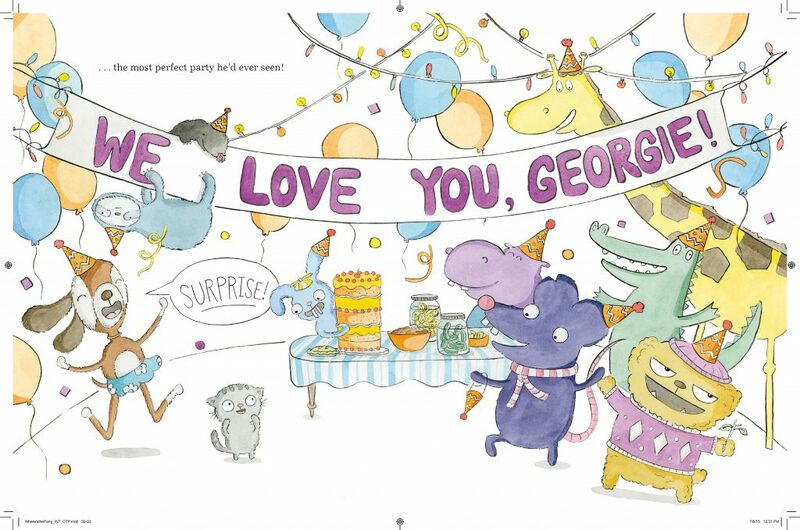 With his furry arms wrapped around a triple-tiered pink, white and blue party cake, Georgie sets out to each friend’s doorstep to issue his invitations in person. Alas, his best friend Feta the dog is too busy making pickles, and Lester the mouse has to untangle a string of lights. Ferdinand the mole can’t be enticed from his hole, and Sneakers (non-specific species) is intently snipping away at his latest evergreen masterpiece. One by one, Georgie realizes he will not be able to round up any guests for his fiesta. His party hat droops, his whiskers dangle dejectedly, and he nibbles at the party cake to console himself. Eventually it is dark and there is no cake remaining, so Georgie trudges home. But wait, it can’t end there can it? No! Of course one’s picture book friends always come through in magnificent fashion, and it is best to discover the tiny, delightful details for oneself. Chan’s critters are simple and goofy, with exaggerated features like buck teeth, floppy ears, and fanged underbites. Georgie the cat is a wide-eyed, cuddly character, full of strong feelings that he expresses clearly in toddler-like fashion. Chan tucks tiny, noteworthy details into every illustration, slyly winking at urban architectural excesses and applying silly Scarry-style labels on mugs, posters and cross-stitch samplers. A super fun Activity Guide available on the publisher’s website provides a cake recipe, printable cake toppers, a party hat pattern, games and coloring pages. Download your own at this link and get ready to party! For Ruth Chan’s website click here. Find out more about Georgie and Feta at georgietales.com. Where Obtained: I reviewed a copy of WHERE’S THE PARTY? 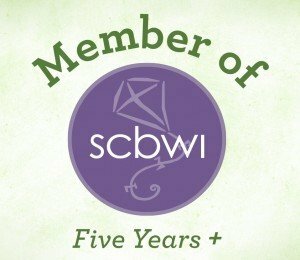 from the publisher and received no other compensation. The opinions expressed here are my own. 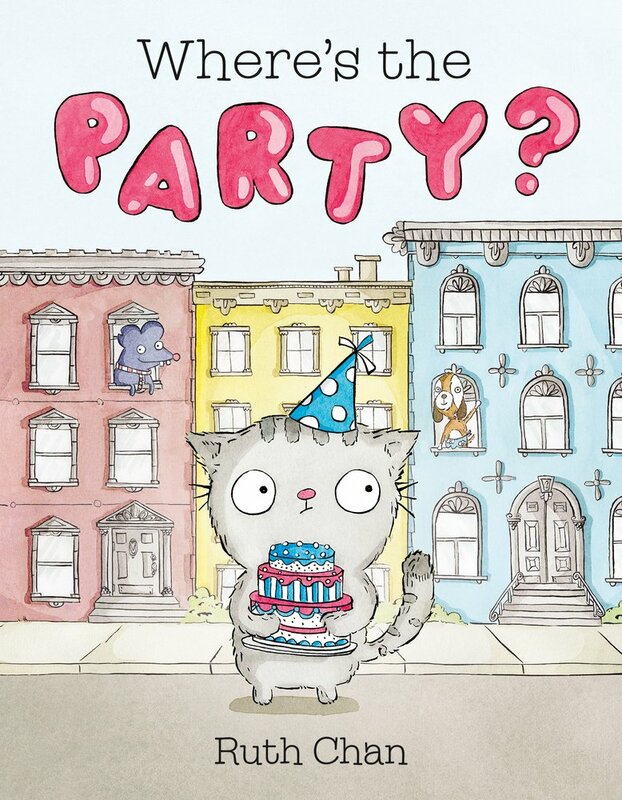 Cathy Ballou MealeyHumorous Picture BookPicture Book about Party Planning CatRoaring Brook PressRuth ChanWhere's The Party?